Thank you so much for your continued support. YOU allow us to keep creating, performing, and bringing this art form to the masses. Read below to find out more about our Members Circle and Legacy Club. You can find the button to donate at the bottom of this page. Thank you and we look forward to seeing you at our next performance! *Members Circle and Legacy Club memberships last for one year. Please contact Artistic Director, Jessica Heaton, at jessicaheaton@wasatchcontemporary.com for more information. We are now registered with Amazon Smile! 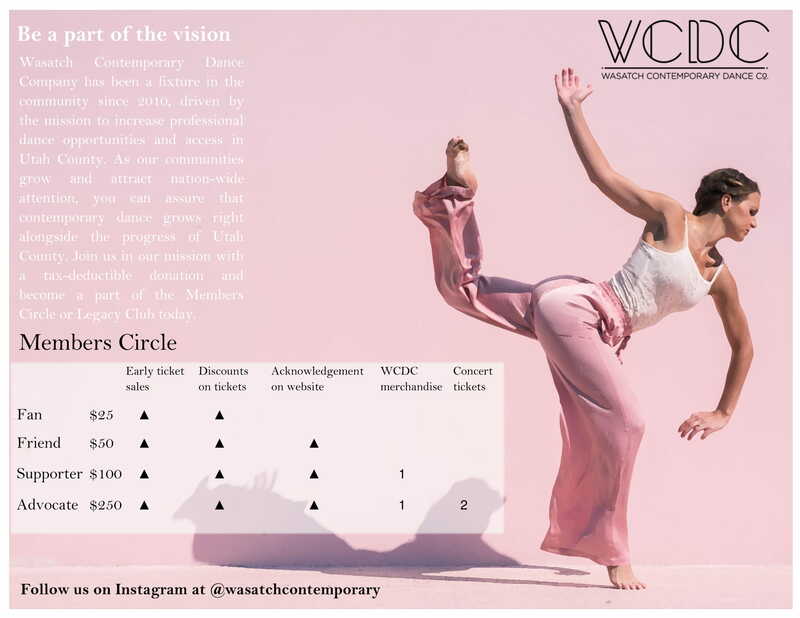 Click HERE, sign in and search for Wasatch Contemporary Dance Company. Amazon will then donate 0.5% of all your purchases to us! Just remember to go to smile.amazon.com, as opposed to amazon.com when you shop. THANK YOU!